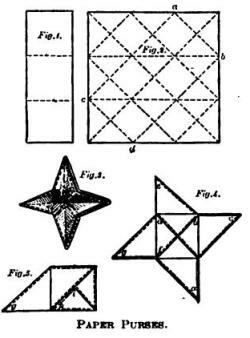 This page attempts to record what is known about the origin and history of the design known in Japan as the menko and in Western Europe and the USA as the pinwheel, puzzle purse or thread container. Please contact me if you know any of this information is incorrect or if you have any other important information that should be added. Thank you. This is one of the few designs for which there is early evidence in both the Japanese and the Western paperfolding traditions. The design is originally a form of tato, a small folded package which was used to contain items such as threads. The design has acquired the name 'menko' because these packages can be used to play the Japanese game of the same name in which one player flicks cards or tiles (also known as menko) to try to turn over, and thus win, another player's cards or tiles, which are laid on the floor. For a fuller description of the game see Wikipedia https://en.wikipedia.org/wiki/Menko. The earliest evidence for the existence of this design in Japan comes from a print in a book by Hayato Ohoka published in 1734 called 'Ranma Zushiki'. This print shows a group of folded paper objects, among which are the traditional crane, komoso, the boat now commonly made from a newspaper hat and a cube. 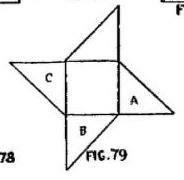 The cube is pictured twice (from slightly different angles) and is identified in the accompanying text as a tematebako or 'magic treasure chest'. The tematebako is made by combining six menko using cuts. The design is mentioned on page 24 of the 1845 Kan No Mado under the title of 'thread container' as one of those designs which are already well known and which are not therefore being included in the ms (in order to 'spare the writer's pen'). 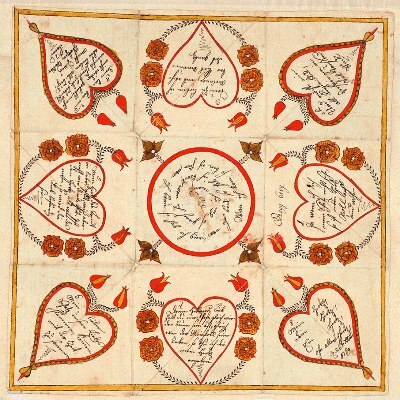 The earliest evidence for this design that I can find outside Japan is a liebesbrief (love letter) in the collection of the Free Library of Philadelphia dated to 26th December 1769 (https://libwww.freelibrary.org/digital/item/5835) The date is in the bottom right corner of the illustration below. The crease lines that divide the large square into a grid of nine smaller squares and allow it to be collapsed into a puzzle purse are clearly visible. 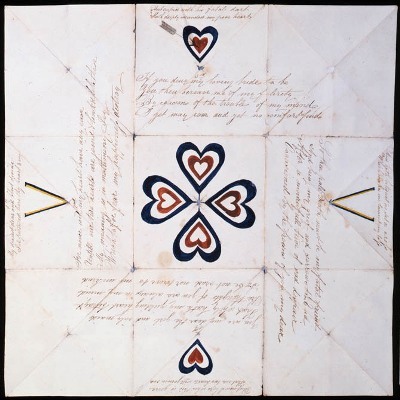 The practice of decorating puzzle purses as love letters was probably brought to Philadelphia by immigrants from Germany and so, although it is now in Philadelphia, this puzzle purse may be of European origin. Puzzle purses were also used as valentines. 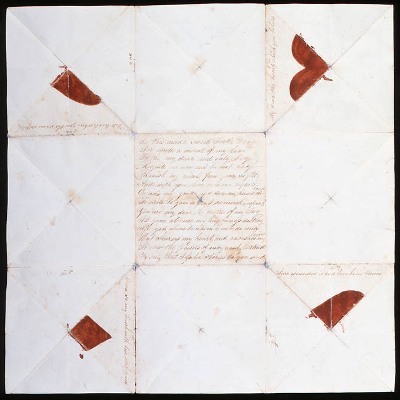 Here is an example in English from the collection of the Postal Museum in the UK dated c1790. The pictures show the front, the back and the fully folded design. 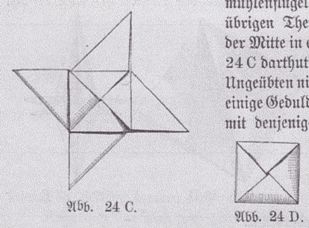 The first known diagrams appear in 'De Kleine Papierwerkers' by Elise Van Calcar, which was published by K H Schadd in Amsterdam in 1863, whereit is called 'Het speldentasche' (the pin badge). 'Un million de jeux et de plaisirs' by T de Moulidars, which was first published in 1880 and subsequently republished under the title 'Grande encyclopédie méthodique, universelle, illustrée, des jeux et des divertissements de l'esprit et du corps', under the title 'La Bourse'. 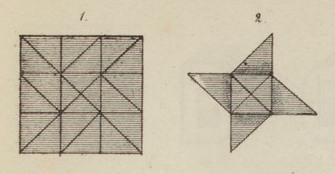 'Cassell's Complete Book of Sports and Pastimes', published in 1882, the paperfolding section of which was based on de Moulidars book, where it is called a Paper Purse. Eleenore Heerwart 'Course of Paperfolding', published in 1895, contains a drawing of the finished purse together with a crease pattern. The design is not named in this book. 'Pleasant Work for Busy Fingers' by Maggie Browne, published by Cassell and Company in London in 1896, where it is called 'The Paper Sweet Box'. This book is an English version of 'Des Kindes Erste Beschaftigungsbuch'. 'Paper Magic' by Will Blyth, which was first published by C Arthur Pearson in London in 1920. The design also occurs in Houdini's Paper Magic, published in New York in 1922, as the Japanese Purse, in Murray and Rigney's 'Fun With Paperfolding', published in New York in 1928, where it is called the Secret Envelope and in Margaret Campbell's Paper Toy Making, published in 1936, where it is simply called the Envelope.